OMEGA™ Mechanical Contactors are designed to be used independently with 120 and 240 Vac control signals or with any of the OMEGA™ temperature controllers. OMEGA™ special purpose contactors provide the process industry with exceptionally reliable control for heating and cooling applications. Long electromechanical life is assured by extra electrical capacity and short stroke magnet design. Silver-cadmium oxide contacts have superior weld resistant characteristics, high conductivity and high resistance to arc erosion. The specially designed contact spacing gives arc over protection up to 600 Vac. Installation is simplified because terminal and mounting screws are accessible from the same direction. 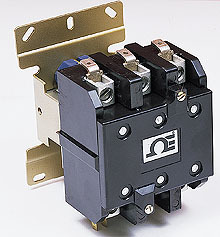 Contactors are designed to be mounted vertically either exposed, in existing equipment, or individually, using NEMA-1 enclosures (Model No. EN-MC2).